Recently, when I moved my truck to mow the lawn, I noticed this scene at a neighbors house. 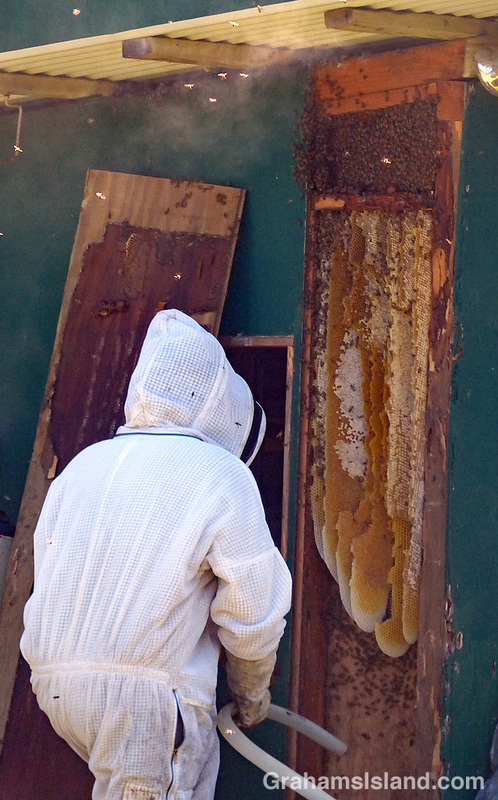 I was impressed by the number of bees and the huge, hanging combs filled with sweet honey. When I got out of the truck, I thought I’d get a few photos. The bee wrangler called out to me that there were a lot of angry bees about. I said I wasn’t going to come closer and asked if it was OK to take photos. He said that was fine, but the bees might come and find me where I was. Since I was a good 70 or 80 feet away, I wasn’t too worried. I snapped a few photos, then heard a buzzing noise, and felt something on my arm. Sure enough it was a bee. I imagined this bee sending back a message along the lines of, ‘Hey, here’s another one of those creatures, but this one doesn’t have protective clothing. Let’s get him.’ I pictured the rest of the colony heading my way in a matter of moments, so I blew the bee off my arm and hotfooted it back home. Before I went inside I made sure I hadn’t accidentally ended up with the queen bee lodged somewhere in my clothing. No need to have my day turn into a starring role in a horror movie. After the lawn was mowed, the bee wranglers were still on the scene so I left the truck where it was. A couple of hours later I thought it would be safe to retrieve it. As I reached the house, the bee wranglers were just leaving. We chatted a bit about what they’d been doing. 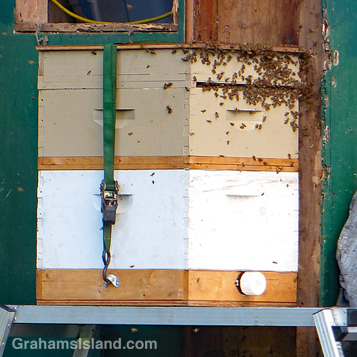 They’d cleaned out the bees’ home in the wall and put a new hive next to it. Presumably they’d found the queen and installed her in her new digs. The idea is to have the bees relocate to the new hive and, when they’re settled in, move it to a new location, probably on one of the farms around here. They warned me, however, that there were still some disgruntled bees flying around. As if on cue, I heard buzzing. Something landed on my head and started burrowing into my hair. The bee wrangler had just handed my his card and I used that to try and extract the bee. The buzzing intensified, but I couldn’t dislodge it. Finally, it popped loose and I took off for my truck. I jumped inside, making sure the door shut properly and the windows were closed, and drove home. I avoided walking past that house for a while until, two days later, the hive was gone and it was safe to venture out again. 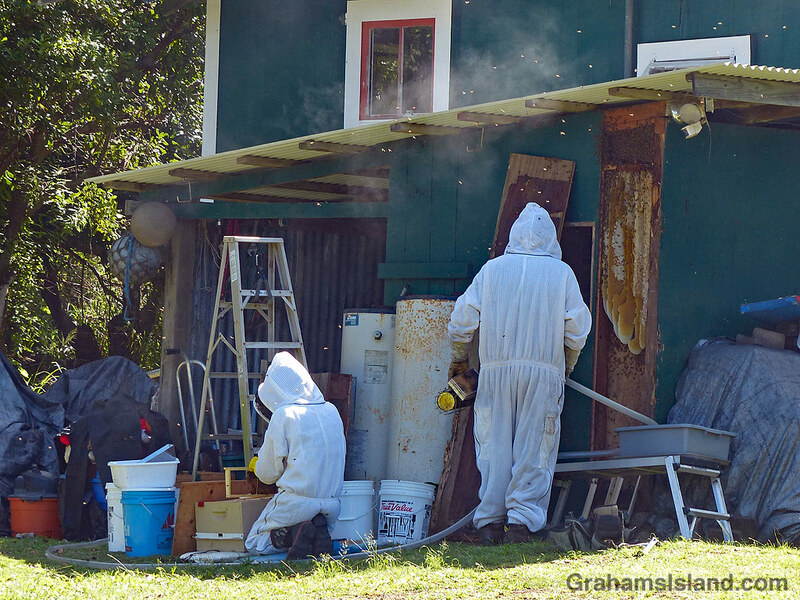 For more information about Ho’ola Beekeepers, go to savehealthrive.com. I’m glad you enjoyed it. It was very interesting talking with the bee wranglers, but less fun having one stuck in my hair! All’s well that ends well, though I wouldn’t have minded having a bit of that honey. Pingback: Sweet – Wall in progress – What's (in) the picture?